During March Break, Hon. 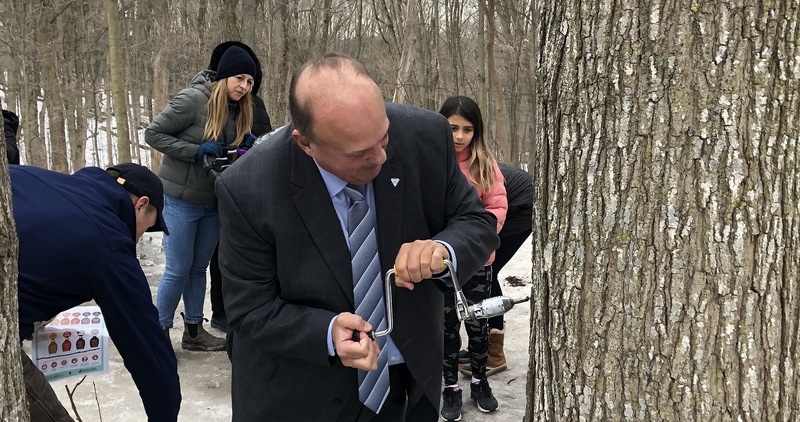 Michael A. Tibollo, Minister of Tourism, Culture and Sport, visited Kortright Centre for Conservation to celebrate spring in true Canadian fashion at the annual Sugarbush Maple Syrup Festival. The Minister was accompanied by Toronto and Region Conservation Authority (TRCA) CEO John MacKenzie, Kortright Centre for Conservation General Manager Adrian O’Driscoll and other TRCA staff as he toured Kortright and took part in many of the festival’s activities. Hon. Michael A. Tibollo (centre) tours the Sugarbush Maple Syrup Festival with TRCA CEO John MacKenzie (left) and Kortright Centre General Manager Adrian O’Driscoll. During his visit, Minister Tibollo tapped a maple tree, tasted different types of maple syrup and learned about historical Indigenous and pioneer maple syrup production methods. Hon. Michael A. Tibollo tries his hand at tapping a tree during his tour of the Sugarbush Maple Syrup Festival. 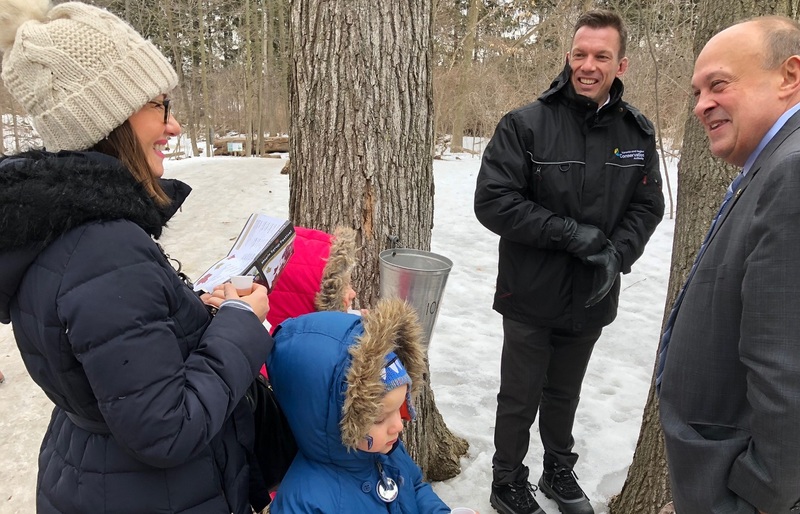 He also toured Kortright Centre for Conservation’s Sugar Shack to learned about the modern method of maple syrup production used today, and enjoyed the chance to interact with some of his constituents who came out to enjoy the festival. Hon. Michael A. Tibollo (right) and TRCA CEO John MacKenzie engage with visitors at the Sugarbush Maple Syrup Festival. 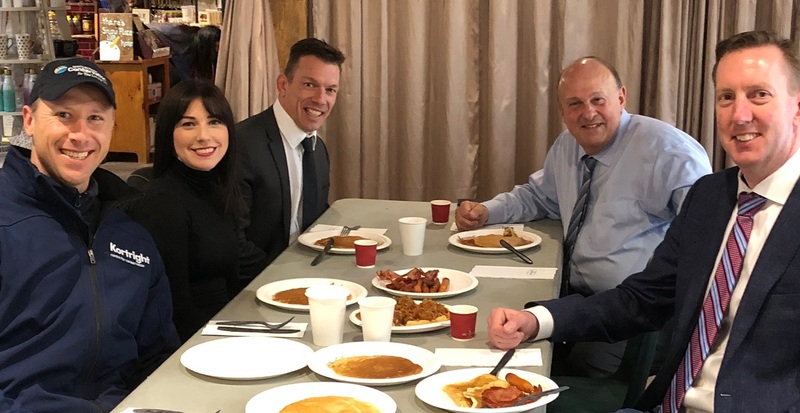 Following the tour, Minister Tibollo enjoyed some of the festival food offerings, such as pancakes, sausages — and of course, pure maple syrup. Hon. Michael A. Tibollo and TRCA staff enjoy pancakes, sausages and maple syrup during the Sugarbush Maple Syrup Festival. Pictured from left: Kortright Centre for Conservation General Manager Adrian O’Driscoll; TRCA Senior Manager of Strategy and Business Operations Michelle Sirizzotti; TRCA CEO John MacKenzie; Hon. Michael A. Tibollo; and TRCA Director of Education and Training Darryl Gray. We would like to thank Minister Tibollo for taking the time to visit Kortright Centre for Conservation and support the festival. The Sugarbush Maple Syrup Festival runs until April 7, 2019. For more information, locations and a full schedule of events, visit maplesyrupfest.com.